The list is provided by The Recreational Aviation Foundation. SamKellner wrote: Great find Bob ! The "Recreational Aviation Foundation" sounds like a closer spirit to the US Hawks than .... USHPA!! (1), an owner or lessee who makes available to any person an area primarily for the purposes of hunting, fishing, or wildlife viewing is entitled to the limitation on liability provided herein so long as the owner or lessee provides written notice of this provision to the person before or at the time of entry upon the area or posts notice of this provision conspicuously upon the area. Every state has laws in effect that deal with recreational land use liability. They basically state that if you allow someone to use your land for recreational purposes without you taking compensation for it, you aren't liable for them if they injure themselves. 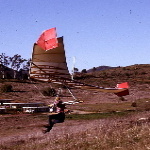 In some states hang gliding is actually mentioned as one of the examples of the types of activities considered to be recreation. Take the advice of Frank, Paul, miracle, and bigbird, all excellent bits of advice. magicpotato wrote: Don't get USHPA involved, though. Bringing in insurance will kill the site for sure. Maybe you could post a link to this topic to hanggliding.org. We've listed the recreational use statutes since 2016. Oh wait, you can only say what Jack let's you say on hanggliding.org. If Jack likes the idea of recreational use statutes, you can say it. If he doesn't like the idea of USHGRS, you can't even mention it. If he doesn't like your references to U.S. Hawks or USHGRS, he just changes your posts. Maybe Jack should just post for everyone and save you all the typing. The injustice of Joe's banning hasn't gone away.